On Thursday, March 3, 2011 the Queensbury Hotel will hold a benefit for the World Awareness Children's Museum to celebrate Mardi Gras! So grab your beads, put your mask on and come support the local children's museum. 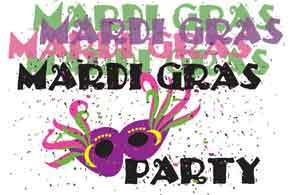 The Mardi Gras Party will feature a wine tasting and sweets from local wineries and restaurants. Wineries include: Peter Brum, Dr. ZenZen, Alpataco, Bully Hill, Brotherhood, Casas Patronales, La Puerta, and Adirondack Winery. Sweets by local restaurants and caterers include: Baker's Dream, Bettie's Cakes, Chocolate Mill, GG Mamas, Lake George Baking Co., Ridge St. Coffee Co., Samantha's, Stomach Cakes, and Wholy Crepes. The benefit will be held in the Adirondack Room at the Queensbury Hotel from 5:00-8:00 p.m. on March 3rd, 2011. The event is $25 per person, in advance, or $30 per person at the door. Send your check for $25 per person along with the names of the people attending to: World Awareness Children's Museum, 89 Warren Street, Glens Falls, NY 12801 or call 793-2773 to pay by credit card.